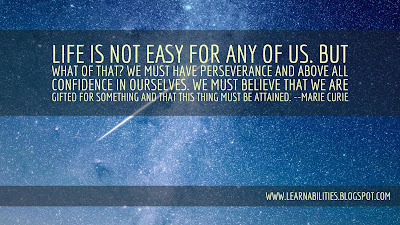 Helping all learners reach beyond their potential. Who are some of the most complex learners in a school? Your twice (or thrice) exceptional learners. An exceptional learner can be exceptional in more areas than one. Often times these children manifest with ADHD plus a learning challenge like dyslexia or dyscalculia. Another manifestation of a multi-exceptional child, are those children who are both gifted and learning disabled. These children often struggle doubly hard because their giftedness and their learning challenges automatically set them apart from their peers not once, but twice. Here is a TED-Ed Lesson that can help both parents and educators gain a better understanding the twice or thrice exceptional student: Gifted and Learning Disabled: Understanding the Twice Exceptional Student. Needless to say, these kids bring a wide range of challenges into the classroom. But, because every child also brings in a whole slew of strengths with them into the classroom, it is vital that educators always take into account a child's abilities when considering programming. Another indicator of a twice exceptional, gifted student is a real disconnect with the world they live in and the world of the classroom. These are often the students who we describe as full of potential, clearly bright, but unable to bring that brilliance and potential to fruition. These kids are often frustrated, bored, tuned-out or distracting. Also, often times, these are the students who struggle with anxieties or a real fear of taking risks. The reasons for these anxieties are often complex and often function as a real barrier for these students reaching their potential. A final key indicator of a twice exceptional student is their frequent difficulty relating to their peers. These kids have such a different perspective of the world, such incredible focuses and interests at such a level of maturity, that they often feel isolated and/or frustrated by their peer group. 1. Teach to the strengths, then provide supports, accommodations and remediation for the areas of weakness. 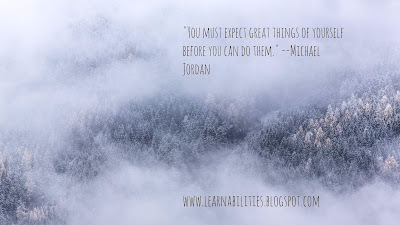 Twice exceptional students need an intellectual challenge and stimulation. If we only focus on their academic weaknesses, we risk disengagement. 2. Provide opportunities for enrichment and intellectual adventures. Let students pursue their singular passion at least some of the day. Condense the curriculum, let students work at their own pace, and then let them free (with support). Too often educators erroneously believe that gifted kids are mini-adults. Many of these students have remarkable abilities, but still need a mentor to help them achieve their goals and dreams. 3. Provide situations in which gifted, twice exceptional students can connect with each other and/or communities in which they express interests. Is there a way that the school counsellor can reach out to the local university or college? Is there a writer, a musician, an artist the student respects. Is there a way to help a child contact this person? Furthermore, are there extracurricular programs like the remarkable and popular TED-Ed Clubs program that provide students with an opportunity to pursue their passions available in your school? Is there a TEDx Event in your area where your students could present their ideas and amplify their passions via a global platform? What about community bands, local maker clubs, artist colonies and start-up clubs? Twice exceptional students need stimulation and novelty. They need safe, cognitively and developmentally appropriate outlets for their intellectual survival. Finally, it is worth noting that in North America, we tend to worry about and support our struggling students. What happens if we forget about our gifted kids? Will they simply find their way, or will some of their latent potential go by the wayside? A great read on the matter is the thought-provoking How to Raise Genius Kids. All children have LearnAbilties. What can we do to help support our students who are twice exceptional both improve their skills and embrace their intellectual singularity? We are our own worst enemy. Especially if we let automatic negative thoughts power our emotional responses to day-to-day events. 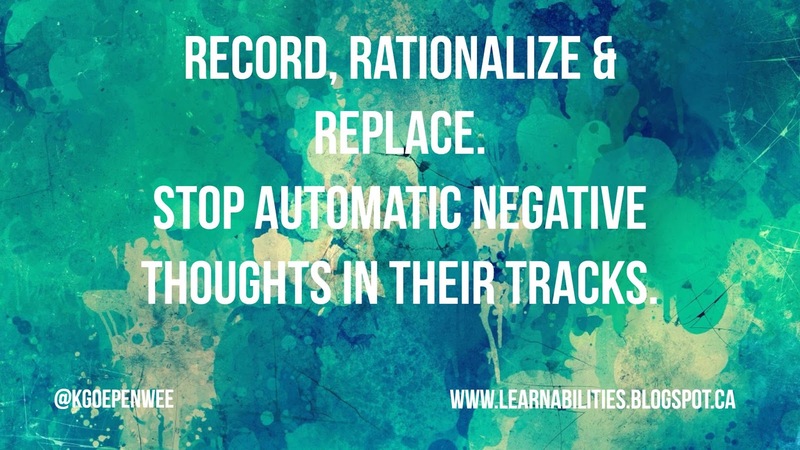 Automatic negative thoughts are irrational thoughts regarding potentially negative situations. 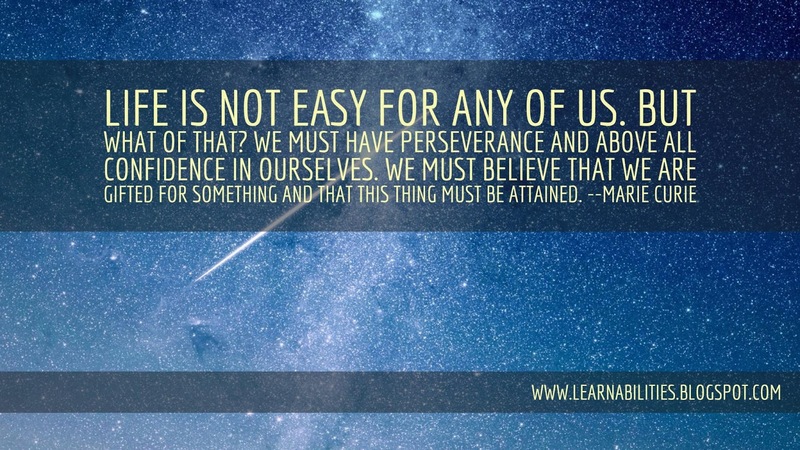 Such thoughts can take over our rational responses to challenges and render a person unable to make the kinds of choices that promote resiliency, growth mindset and grit in tough situations. As an educator working exclusively with students who struggle with learning and attention difficulties, I find that many of my students struggle with poor self-esteem and sometimes crippling anxiety. Often, their default mode in a tough or potentially frightening situation is to engage in negative self-talk. Once this negative self-talk begins to become their normal response to a difficult or challenging situation, they become increasingly reluctant to take risks, much to the detriment of their education. 1. Learn to journal, examine and reframe their thoughts. 3. Learn to ask for support. This TED-Ed Lesson (Automatic Negative Thoughts: Calming the Storm Within) addresses all of the above three strategies by providing educators and parents with a number of useful articles, strategies, and tools that they can use assist either their child or students manage and or stop automatic negative thoughts. Every student has LearnAbilities. As educators and parents, let's take the time to educate ourselves about the power automatic negative thoughts can hold over our children and students. With knowledge and strategies, we have the ability to not only reframe how we speak to our children and students when they struggle with negativity, but to model positivity, resilience, and the active decision to not let our own thoughts hold us captive. 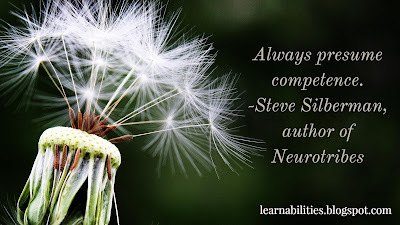 With Every Student, Always Presume Competence. One of the great pleasures of teaching is the daily exposure to the great diversity of minds. No two minds are ever the same and it only makes sense that educators need to know as much as they possible can about how students learn and how to provide the most conducive environments for learning possible. 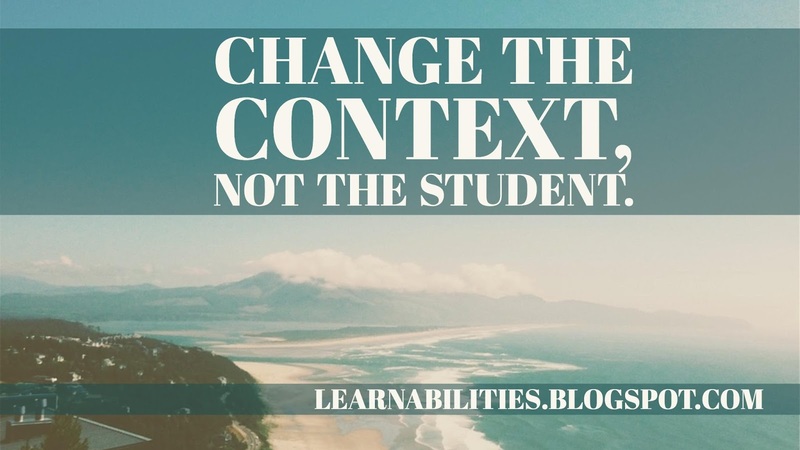 By understanding the concept of neurodiversity, and shifting our perspective as teachers away from the notions of disability and deficits to the notions of ability and presumed competence, we pave the way for all students to learn. 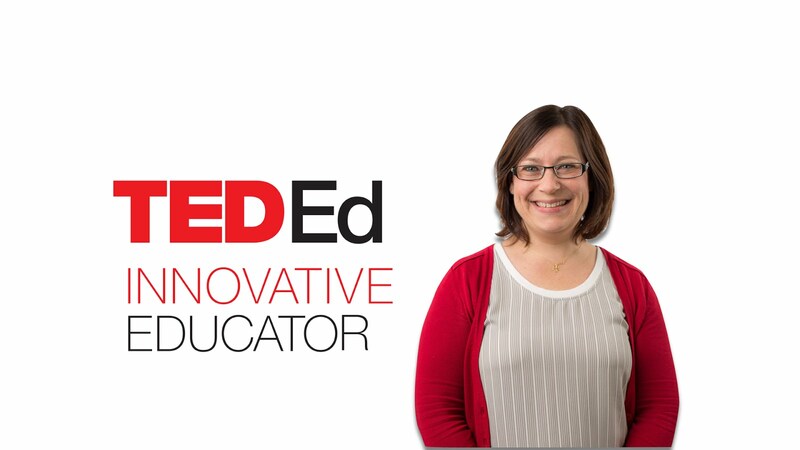 Recently, the TED-Ed Blog featured a Q&A with Silberman. In it, Silberman provides insights that will be beneficial to any educator who has Autistic and/or Neurodiverse children in their care. You can access it here. For me, Silberman's most important statement is that as educators, we must always presume competence. A child is hardwired to learn. Finding out how that child learns is of course the challenge, but in this day and age where we are beginning to realize just how much disability is societally constructed, it is perhaps even more important that we enable our teachers to be as creative and flexible in their practice as possible. Educators also need to be optimists. They have to believe, in their bones, that progress is always possible and that there is always a way. Finally, they need to have empathy. Out of empathy, arises a desire to do the best they can. But empathy can only come from knowing. Here are two talks that do not dismiss the difficulties neurdiversity can bring into a person's life, but, at the same time, celebrate the fact that human life in only possible because of difference. 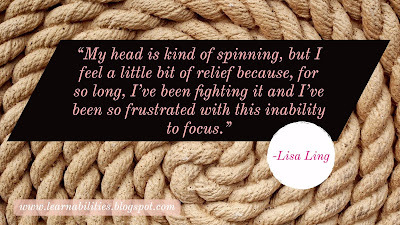 It is never my intent to dismiss just how difficult teaching can be. Neurodiversity presents many, many challenges and a neurodivergent child's LearnAbilities aren't always immediately manifest. But if we focus first upon what a child can do before focusing upon all the things they struggle with, maybe, just maybe, we can begin to create a world where everyone gets the education they deserve. Three Interactive Video Lesson Platforms that ALL Teachers Should Know About. Students love videos. Teachers love videos. We ALL love videos. And, for many of us, we learn so much better if we can see what we need to learn. However, as every teacher knows, a video can be a moment in the class when you actually lose student engagement due to a number of factors. Videos, despite their appeal and potential very rarely extend a student's understanding in a profound manner because every student's experience with a video is different. But, with the recent development of a slew of interactive video lesson digital tools, teachers can now take a video and essentially personalize the learning experience for their students quickly and effectively. Furthermore, the busy teacher can now access oodles of pre-made video lessons from a wide variety of sources that can be used as is or customized to suit the individual needs of any classroom or teacher. This platform is easy to use and offers a number of features that make it a really great choice My favorite feature is it's simplicity of use. Simply upload your video, trim to include only the content you want with a ridiculously easy to use trimming system of sliding bars, and add in your questions. Oh, and if you want to provide narration of your video yourself, you can record your very own audio track. Pretty cool. Like all of the platforms featured in this post, you can access your class analytics. Unlike Playposit, you can do so for free. EDpuzzle is one of those digital tools that seems really simplistic, and, if you want, you can really just use it to teach basic comprehension of key concepts. 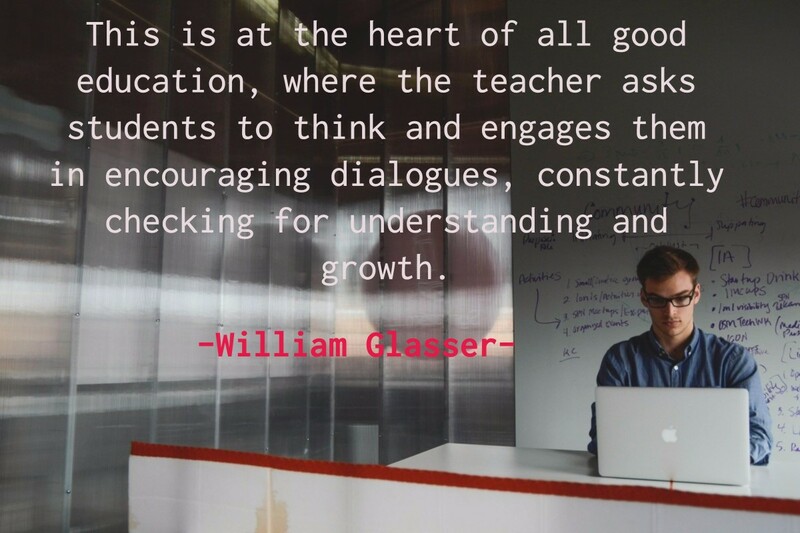 However, it's how educators pose questions, how they use the editing features of this platform to their advantage, and how they choose to deploy the lesson that makes all the difference in terms of whether or not the digital tool is any better than giving students the textbook and a worksheet. Like EdPuzzle, Playposit has a very simple platform. It offers a teacher many, many options when comes to formatting and there is essentially nothing you can't do with the editing manager. Like EdPuzzle you can trim your video. Playposit also has an audio feature which is very useful if you teach students who need audio. However, students can't record their answers in audio, and students complain about the fact that the editing manager does not include a spell-check feature. You can also broadcast and/or share your lesson, but after multiple uses of this feature, both myself and my students find it awkward to use: it does not work very well on the Chrome browser and the video takes A LONG time to load. This lag drives my students crazy. As well, Playposit does offer a library of pre-made, ready to go "bulbs" (lessons) that are well organised according to discipline and sub-disciplines. And, like with the other platforms discussed in this post, teachers can customise these bulbs. Furthermore, if teachers want to, they can pay for a premium mode that enables them to print out their lessons as worksheets and gain access to more question types: rather cool features; however, to be honest, I wish such useful tools were free. Enables students to "Dig Deeper"
The most simple platform out the four. Don't let this fool you. Its simplicity is deliberate. It doesn't have the bells and whistles of the other three (it really needs an audio feature) but it's neutral design and structure enables educators to do with it what they will. Furthermore, it is completely free. Just like the other platforms, teachers can add in questions and get class analytics. Each lesson has five components: Watch, Think, Dig Deeper, Discuss, ...And Finally. The more you use this platform, the more you realize you can play with those five sections and shape them specifically to your needs. Furthermore, it's simplicity enables you to integrated lessons from the other two lesson platforms into the Dig Deeper Section. Speaking of the Dig Deeper section, it is in this section along with the "...And Finally" section that TED-Ed enables teachers to truly elevate and expand not only the depth but the breadth of learning in their classrooms by bringing in critical thinking and extension activities. A perfect example of a lesson that pushes students to think critically and deeply is Josefino Rivera Jr.'s The Danger of a Single Story. Heightened student engagement. Not one of my students does not like to learn this way. The ability to pick and choose which lesson platform best suits both the needs of my students and the purpose of a learning experience. The ability, when used mindfully and critically, to enable students to move beyond the basics of a lesson into deep, critical thought. The ability for every student in my class to learn at their own rate. As a special education teacher, this is, for me, the greatest gift. I can also customize each of these platforms in ways that enable me to provide accommodations, remediation and enrichment all in the same lesson. Students appreciate having video broken into manageable pieces. A few of my students prefer to see the video in it's entirety first, but everyone always goes back to the questions. The ability for students to highlight their own learning or personal interest by building and researching their own lessons. Students can create their own lessons using the TED-Ed Lesson platform once they register as a user. It's an amazing and rich learning experience to learn how to present and teach your own lesson. A superb way to help a student catch up after an absence. I no longer need to re-teach and re-teach key lessons. By building a solid library of video lessons and then posting them to my LMS of choice, I provide a tool that enables every child to learn no matter where they are. So, in closing, one final note: none of these tools offer one-stop shopping. If ever a design team comes up with a platform that combines TED-Ed's ability to elicit deep learning, combined with Playposit's suite of editing tools, combined Edpuzzle's shear ease of use, they will corner the market. Until then, I'll leave it up to you to decide which one works best for you. Enjoy and together, let's help our students take advantage of their LearnAbilities. ADHD can seriously hamper a child's ability to achieve their potential. In fact, research shows that 60% of children with ADHD who do not receive support or diagnosis will struggle or underachieve in school. This statistic is troubling for all the obvious reasons, but one of the most troubling reasons for this statistic is that it only refers to boys. Girls, up until very recently, have had their ADHD chronically undiagnosed and this lack of diagnosis has often profound implications upon a girl's life for young women tend to internalize their struggles and it is this internalization that often results in significant problems with their mental health, their self-esteem, and their ability to lead productive adult lives. However, girls with ADHD, just like boys, have enormous potential and latent LearnAbilities so what can their parents and teachers do to help them out once a diagnosis has been made? 1. Educate yourself about ADHD and Girls. Not always, but generally speaking, symptoms manifest themselves differently than with boys. 2. Seek out treatment. There are so many options and medication is only part of the range of therapies that are helpful. 3. Empowerment. Girls and young women need to know about what ADHD is, what it's effects are, and what they can do about it. 4. Work towards removing the gender bias that often clouds diagnosis. 5. Address the incredibly powerful (and often negative) role that societal pressures play in girl's lives. These pressures are even tougher to deal with when a young girl or woman is struggling with ADHD and all of it's possible comorbidities. 6. Help girls and young women realize that while ADHD is often considered a medical condition, disability on a whole is simply a social construct predicated on a narrow and confining definition of "normalcy". There is no such thing as being normal and helping girls understand this truth will only enable them to be stronger and more accepting of their own version of uniqueness. 7. Let them read about and listen to women like themselves who live and work with ADHD. A great example, especially for young women is Jessica McCade, a YouTuber, who has a great channel dedicated to ADHD. And here is a TED-Ed Lesson to go with the video: ADHD in Girls: How to recognize the symptoms. Please feel free to use the lesson, share it and/or customize it to suit your own needs. Finally, maybe the best way to help a young woman come to terms with her ADHD diagnosis is to simply be supportive, understanding and proactive. By working together to create actionable solutions, parents, teachers, girls and young women can fulfill the potential of every girl's LearnAbilities. Rather than focusing on "fixing" students, DES (Disability Studies in Education) places an emphasis upon things that are actually within teachers' spheres of influence by placing the focus on changing classroom structures and practices to supporting a full range of student learning needs within diverse and inclusive classrooms. 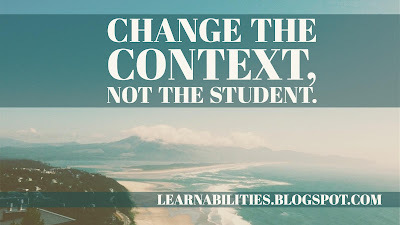 What if we looked around our classrooms and asked the question "What constraints are standing in the way of ALL my students mastering the curriculum I teach?" and then went about mindfully removing those barriers? 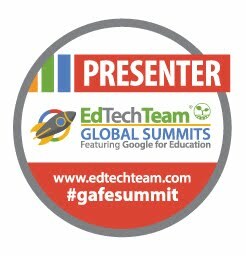 What would I have to change for equitable learning to take place? This post is a provocation. It's a provocation asking educators to do better in ensuring that the classroom environment they design with their students is universally accessible to all of their students regardless of their preferred learning mode. This provocation came from two places. Kathleen Collins' and Beth Ferri's excellent article in this month's Journal of Adolescent & Adult Literacy (Collins Kathleen & Ferri Beth. (2016). Literacy Education and Disability Studies: Reenvisioning Struggling Students. Journal of Adolescent & Adult Literacy, 60(1), 7–12. doi: 10.1002/jaal.552) which you can read in its entirety here, and Elise Roy's splendid TEDxMidAtlantic Talk "When we design for disability, we all benefit" which I've included below. In response to the provocation to design better, more equitable learning environments for my students, I wrote a TED-Ed lesson based upon Elise Roy's TED Talk that explores how design thinking plus universal design for learning could solve much of the difficulty that marginalized and/or struggling students often encounter in school. You can access that lesson here. By no means exhaustive, the lesson does provide video definitions of both design thinking and universal design for learning and a few resources that should enable any educator to begin to design a more inclusive learning experiences for all students. Feel free to use it, share it or customize it. Finally, I've included two more useful resources. The first one is a TED playlist about designing for disabilities that is sure to provoke you, inspire you, and make you want to rush out and embrace universal design. The second one is a superb resource available to educators from IDEO a design organization that pioneered design thinking. You can download their free toolkit for educators here. Intentional inclusive classrooms foster a sense of belonging by providing a challenging and supportive curriculum and creating a positive classroom and school culture where every student is valued, respected (Shogren et al., 2015), and represented. -Kathleen Collins & Beth Ferri "Literacy Education and Disability Studies: Reenvisioning Struggling Students. Everyone has LearnAbilities and inclusive education is, at its heart, democracy and equity of opportunity. Let's continue to work together and make learning possible for every student. It's a provocation asking educators to do better in ensuring that the classroom environment they design with their students is universally accessible to all of their students regardless of their prefered learning mode. IDEO a design organization that pioneered design thinking. You can download their free toolkit for educators here. Check out this amazing program! Follow me to learn more about helping kids reach their potential.